Tropic Air announced on Tuesday, February 26, 2013, that on Friday, February 22nd, after ten months of work, Tropic Air received a license from the Government of Mexico. Tickets for this highly anticipated flight from Belize International Airport to Cancun, Mexico, are now available for sale. 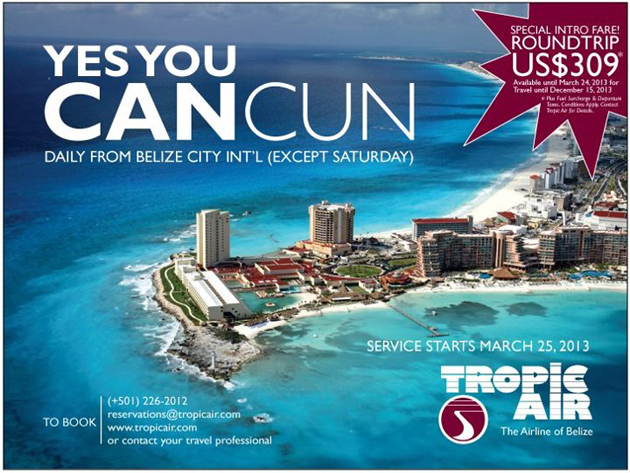 Effective March 25th, 2013, Tropic Air will launch 6 weekly flights (daily except for Saturday) between Belize’s Phillip Goldson International Airport (BZE) and Aeropuerto Internacional de Cancún, Mexico (CUN). Tickets are on sale now through March 24, 2013 at an introductory fare of $309USD round trip from Belize City to Cancun for travel between March 25th, 2013 and December 15th, 2013. Fuel surcharge, taxes and other conditions may apply.